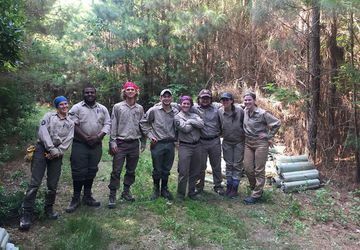 ACC Youth Crews introduce youth and young adults aged 16-18 to community service and resource conservation through hands-on project work. Projects may include trail construction & maintenance, habitat improvement, improvements to recreation access, re-vegetation, and much more. Through a combination of education, service, and professional development, ACC Youth Crews provide a well-rounded, challenging, productive, and beneficial experience. Get outdoors, work hard, get things done. Through the sweat, bugs, and physical work, it may not always be easy, but it's great. Youth crews typically run during the summer months - June, July, and/or August. Applications will be accepted on a rolling basis starting in late February 2019. Check back soon for more details or reach out to ACCrecruiting@conservationlegacy.org!